Statistics compiled by the Centers for Disease Control and Prevention reveal that 29 people die each day due to motor vehicle operators who drive while under the influence of alcohol, which equates to 10,585 deaths due to intoxicated drivers each year. One of the reasons why many of these accidents occur is that alcohol slows down a person’s response times as well as many other detrimental effects including lost concentration. Among the many questions that people involved in New Jersey motor vehicle accidents involving alcohol ask, one of the most common is whether locations like bars that provide alcohol to drivers can be found liable. The answer to this question is quite complicated, which is why individuals who are involved in these accidents should not hesitate to speak with an experienced accident attorney. The server negligently provided a visibly intoxicated person alcohol. The server negligently provided a minor with alcohol when the server should have known that the person was below the age of 21. The injury was a foreseeable result of providing alcoholic beverages. Over the last decade, courts in New Jersey have found numerous situations in which a bar should be held liable because an individual was determined to be intoxicated at the time that he or she was provided alcohol. In the 2013 case of Halvorsen v. Villamil et al., a man who drank alcohol at TGI Friday’s then drove home, ended up in a crash, and injured a woman and her children, the court determined that based on how intoxicated the man was and his body size, there were visible symptoms that the man was already intoxicated at the time he was provided with additional at TGI Friday’s. As a result, the court held that TGI Friday’s could be held liable. Some of the signs that a person is intoxicated include bloodshot eyes, smell, impaired motor function, and slurred speech. Law in New Jersey allows a person to obtain compensation from a person or “host” who supplies an intoxicated party-goer with additional alcohol. As a result, if you go to a party where the host provides alcohol to a visibly intoxicated guest who later injures you, it is possible to obtain compensation from both the host and the intoxicated person. 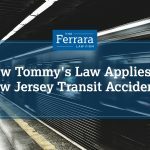 If you are involved in any type of accident in New Jersey and another party is responsible, you should not hesitate to contact an experienced attorney who will remain committed to obtaining the compensation you deserve. 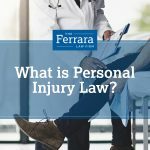 The attorneys at Ferrara Law have significant experience helping individuals navigate these challenging situations. We understand these accidents can leave you facing medical bills, emotional pain and suffering, lost wages, and property damage. Contact us today for assistance.